Tangled and True: National Turn the TV Off Week. 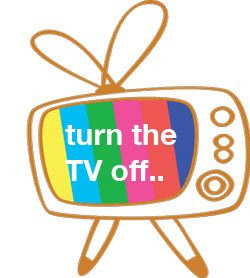 It's National Turn the TV off week. Are you participating? We were until my husband turned the TV on for the girls this morning.. I had to quickly turn it off and re-explain.. we were almost over the hump. Now not so much. Totally have this battle with hubbs frequently. He grew up with TV on 24 hours a day, 7 days a week. Baby steps, right?